Be the first to share your favorite memory, photo or story of Duane. This memorial page is dedicated for family, friends and future generations to celebrate the life of their loved one. Age 95 of Owosso passed away Sunday, October 14, 2018 at Oliver Woods Retirement Village. The family will receive friends at the funeral home on Tuesday, October 16, 2018 from 4pm to 8pm. Funeral services will be held 11am Wednesday, October 17, 2018 at Nelson-House Funeral Homes, Owosso Chapel. Burial will follow at Fairfield Township Cemetery. Duane was born November 9, 1922 in Carland, the son of Earl and Gladys (Curtis) Darling. 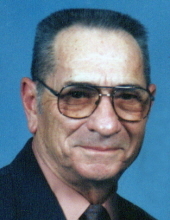 He graduated from Ovid High School, class of 1941 and proudly served in the United States Army Air Corps during WWII as a radio operator in the Signal Corp.
Duane was a member of Owosso Church of Christ, Durand Locomotives Square Dancers, and the N.R.A. He enjoyed hunting and spending time with his family and friends. Duane married Josephine Beach in Flint on June 29, 1946; she predeceased him on February 7, 2007. He spent his life running the family farm and retired from General Motors in 1983 after 30 years of service. Duane is survived by his daughter Paula Darling of Corunna; 3 sons Douglas (Connie) Darling of Allegan, Neil (Karen) Darling of Byron and James (Lori) Darling of Roscommon; 13 grandchildren; 14 great-grandchildren; 1 great-great-great grandchild; brother Ernest Darling of North Carolina; other loving family and friends. He was predeceased by his wife Josephine, daughter Nancy Nixon and 7 siblings. Online condolences may be sent to the family at nelson-house.com. To send flowers or a remembrance gift to the family of Duane Orrin Darling, please visit our Tribute Store. "Email Address" would like to share the life celebration of Duane Orrin Darling. Click on the "link" to go to share a favorite memory or leave a condolence message for the family.